One of the cornerstones of Kendal at Oberlin is its inviting natural environment. The campus encompasses over 100 acres, with more than 1,100 trees (50 different species) and eight ponds. With the grounds now accredited by ArbNet as The John Bartram Arboretum and ongoing resident-driven efforts, Kendal can now offer even more opportunities for enhancement and education. “The arboretum is one of the most important, if not the most promising, developments at Kendal that I have experienced in my 25-year association with Kendal,” CEO Barbara Thomas said at this spring’s second annual Arbor Day celebration. The John Bartram Arboretum at Kendal at Oberlin is named after a Pennsylvania Quaker and botanist from the 1700s. Often the Arboretum Subcommittee of the KORA Horticulture Committee begins its educational outreach by talking about its namesake. A friend of Benjamin Franklin and other founding fathers, John Bartram collected specimens and seeds native to North America, which he distributed along the east coast and shipped overseas to Europe. He is considered the first American-born botanist. Lots has been accomplished in the past two years since The John Bartram Arboretum achieved Level 1 accreditation from ArbNet, an international network of arboretums and other tree-focused institutions founded by the Morton Arboretum in Illinois. Of the nearly 2000 certified arboreta listed on the register, Kendal’s is the only one named for John Bartram. It is the only arboretum in Northeast Ohio to be located at a retirement community. Before we review past accomplishments, let’s talk about a few projects underway. With the help of Oberlin College Environmental Studies students, a tree assessment was completed. Unfortunately, the results are troubling. “About 80 percent of our trees are suffering and not thriving because they were either dug too deep or mulched too high, or both. We are at the beginning of deciding what to do next,” explains Chair Larry Dunn. The arboretum’s new Commemorative Tree Donation program will help bring new trees to campus. So far, about 8 trees have been donated in memory or in honor of someone. Donation is $500, which covers the cost of acquiring a tree, planting and labeling it, maintenance and replacement if it dies within two years of planting. Committee members are consulting with donors to select tree type and site. 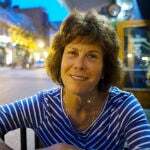 “We need to be sure we plant trees that will thrive here,” Arlene Dunn says. Another area of concern is the soil. 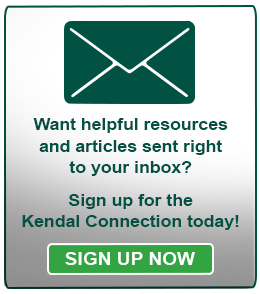 Kendal, like most post-war housing and commercial construction projects, was developed using heavy large-scale earth moving equipment. As a result, the soil was heavily compacted and lifeless. Committee members are now testing three methods in different locations to determine the most effective way to aerate and revitalize the soil, restoring its natural living ecosystem. The committee plans to plant new trees in the three locations over the next year. “The first clue to how well the methods are working will be how easy it is to dig,” Larry says. Community-wide interest in the arboretum is growing, as residents walk around campus and see test sites underway and other committee activities. To help educate the community, Anne Helm is writing a monthly article for the Kendalight newsletter, with an accompanying display in the Heiser Lounge. In June, Anne wrote about planting a memorial Bur Oak at the city’s Westwood Cemetery. “Our arboretum gave this baby oak to the city as part of our second Arbor Day celebration, since Oberlin had lost a number of very large trees at the cemetery in a storm last year. This Bur Oak will become a gorgeous, stately tree, living long past our lifetimes,” she wrote. The committee is also doing research on developing a Young Tree Training program, starting with pruning the youngest trees first, followed by restorative pruning on the healthiest older trees. “Residents are frequently thanking us for what we are doing and are very appreciative of the efforts we’re putting into this,” Arlene says. “And many of them want us to do more,” Melissa Reed adds. 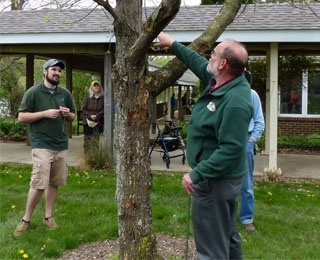 Arboretum members work closely with Matt Hannon, Kendal at Oberlin grounds coordinator. A recent board of directors’ reorganization, fueled by a new strategic plan, will give members more voice. “We will have a role to play in the new campus plan committee. It gives us a place to bring facts and analysis. We see it as a new era of tree care,” Larry says. A $5,000 grant from Kendal Charitable Funds in late 2015 helped launch the arboretum. “Your support has enabled The John Bartram Arboretum to make substantial progress in achieving our vision of the arboretum as a source of new value to Kendal at Oberlin residents and administration and for the community at large,” Larry Dunn wrote in the final report for Charitable Funds. Two Arbor Day celebrations featuring public education. communities and business districts with healthy tree cover attract new residents, industry and commercial activity. Arbor Day Foundation lists even more benefits. Also this year The John Bartram Arboretum was one of six member arboretums to receive a $1,000 grant from ArbNet. The committee will eventually seek Level II accreditation from ArbNet, which includes developing a tree collections policy. “It’s an important step for us to take at some point, but not at the top of the list,” Larry says. For now, the committee has plenty of projects that are of higher priority. Are you interested in learning more about this collaborative, innovative project and Kendal at Oberlin? Learn more about the John Bartram Arboretum and other projects by the community-minded residents of Kendal at Oberlin by contacting us for a brochure, tour or more information.